E-Flocx® is an accelerated electrocoagulation system which destabilises dissolved, colloidal, emulsified and other stable compounds in water and converts them into suspended particles. These suspended particles get removed on filtration/ clarification and result in colourless, odourless and reusable water. 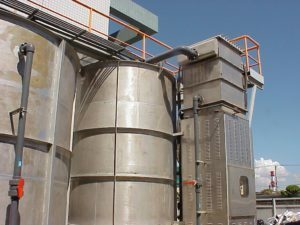 E-flocx® has proven to be a very versatile process able to handle large variety of wastewaters of different volumes. Hydrox is a catalytic media oxidation process helpful for removal of recalcitrant organics present in the waste water which are non-biodegradable in nature and hence, biological systems are unable to treat. Fenton Catalytic Reactor is a specially designed reactor process for undertaking Fenton Oxidation of wastewater with low input COD (150-1500 ppm COD). The process is designed especially for wastewater stream which have difficulty in meeting final discharge or reuse norms. The input to the process is generally in the range of 150-1500 ppm and the output can be matched according to the need of the industry. In certain cases it can also be reduced as low as < 50 ppm. The process employs a combination of homogenous and heterogeneous catalyst resulting in optimum use of Hydrogen Peroxide and minimal sludge generation compared to conventional Fenton processes. With plants ranging from 5 MLD to 180 MLD in operation since the last 20 years, it has proven to be a versatile process catering to a wide range of influents and volumes. EFR Process is a hybrid process combining the oxidative potential of Hydrogen Peroxide along with the in-situ generation of other oxidative species like Hydroxyl Radical, Chlorine species (Hypochlorites, Chlorates and Perchlorates) by rare earth metal electrodes and electricity. Primarily used for treatment of industrial effluents with very high recalcitrant organics (in the range of 5000-15000 ppm COD), EFR can handle shock loads and varying concentration of Total Dissolved Solids for effective organics removal and increasing biodegradability of tough to treat or non-biodegradable influents. Sequential Batch Reactor is one of the oldest biological based technology being used for the treatment of sewage water for years. Recent developments make SBR a viable option for small to medium size facilities. 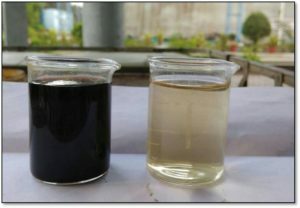 This technology is a type of activated sludge process for the treatment of wastewater which treats wastewater in batch mode through a series of treatment scheme. Fill: The Inlet valve is open and the wastewater is filled into the reactor. React: Aeration of mixed liquor is performed during the second stage and the impurities are break down with the help of microbes. Settle: The aeration and any mixing is stopped and the solids are allowed to settle in the third stage. Decant: The supernatant water is decanted and collected into treated tank or discharged. Idle: This is a step in between decant and fill and in this step some part of sludge is pumped out a process called wasting. Our Activ-Ox systems are versatile to the fluctuating incoming load and have flexibility and better control to the treatment process making Activ-Ox the ideal treatment process for such conditions. 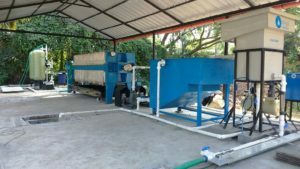 Moving Bed Biofilm Reactor is an advanced process of conventional biological (Activated Sludge Process) process as an attached growth type process. The aeration tank is partially filled with the packing media generally made of plastic and have density closer to water. These packings have high surface area and the microbes treating the wastewater are attached to these packings. With the help of aeration these packings are kept in movement inside the aeration tank continuously. These systems can be designed either in civil based or as a complete packaged system as per requirement. With the help of our specialised design and packing media with high surface area, Bio-flocx systems are capable to sustain high MLSS (up to 5000 mg/l) which help in better contact between biomass and impurities in wastewater. This helps us to design our systems at lower retention time and hence lower footprint. Membrane bioreactor is a combined hybrid technology between bio-reactor technology and membrane technology that requires lesser space and lower number of treatment units. Depending on the end use either microfiltration or ultrafiltration membranes can be chosen in combination with the bio-reactor. 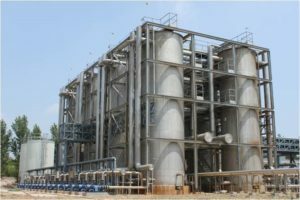 Due to membranes combined directly after bio-reactor, multiple treatment processes- clarification and tertiary treatment processes like multi-grade filter, pressure, sand filter, activated carbon filter etc. are not required resulting in lowest foot print and highest treated water quality which can be reused for non-potable applications or fed to Reverse Osmosis Systems for further treatment if desired without needing additional pre-filtration steps that are generally required. With our expertise in design, experience and complete automation, Rapid-Ox is capable to operate at high MLSS (up to 15000 mg/L) and hence the oxidation of impurities takes place rapidly with lower retention time and lower footprint. With the help of MBR systems we can easily achieve quality of treated water which can be reuse in various applications like Irrigation, Toilet Flushing, HVAC make up water. Microfiltration is a type of physical filtration process where a contaminated fluid is passed through a special pore-sized membrane to separate microorganisms and suspended particles from process liquid. Microfiltration is only able to remove bacteria and part of viruses. Because of small size these virus passed through microfiltration membranes and therefore can’t be removed in this process. Membranes with the pore size of 0.1 to 10 µm are used for the microfiltration. 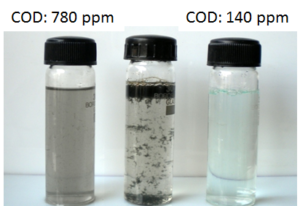 Microfiltration can be implemented in many different water treatment processes when particles with a diameter greater than 0.1 mm need to be removed from a liquid. Generally, MF is used as a pre-treatment to the further separation to remove any colloids, suspended solids, soil and grit which helps to increase the RO and NF membrane life and reduce frequent back wash.
Ultrafiltration is a type of physical filtration process where a contaminated fluid is passed through a special pore-sized membrane to separate microorganisms and suspended particles from process liquid. The pore size of UF membranes varies from 0.001 to 0.1 µm. The UF systems are capable of removing suspended solids, colloids and microbes completely. 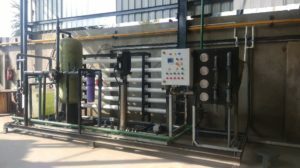 Therefore UF systems are used for the disinfection and purification of drinking water and as a pre-treatment process of Nano Filtration and Reverse Osmosis Systems for industrial and municipal waste waters. Our Techno UF systems use membranes which have high flux, higher recoveries and operate at lower operating pressure that optimize overall energy requirements. Nano filtration is a technique that has prospered over the past few years. Today, nanofiltration is mainly applied in drinking water purification process steps, such as water softening, decoloring and micro pollutant removal. During industrial processes nanofiltration is applied for the removal of specific components, such as coloring agents. Nano filtration is a pressure related process, during which separation takes place, based on molecule size. Nanofiltration have different applications in different industries. Because nanofiltration membranes have good retention to the multivalent ions therefore it is used for the softening of water. Because NF membranes have very less retention to univalent ions but good retention to organics therefore it is used for the separation of univalent salts and dyes. We expertise in designing and manufacturing tailor made nanofiltration systems as per process requirement and application. Reverse osmosis is a well-known process use for water purification for many years. The semi-permeable membranes are used in the RO systems to remove ions, molecules and larger particles. The RO membranes have pore size in the range of 0.1 nm to 1 nm. 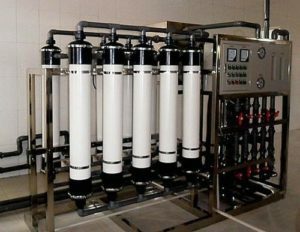 Reverse osmosis can remove many types of dissolved and suspended species from water, including bacteria, and is used in both industrial processes and the production of potable water. The result is that the solute is retained on the pressurized side of the membrane and the pure solvent is allowed to pass to the other side. With less salt than sea water and more salt than freshwater, brackish water is the result of the mixing of these two types of water. Brackish water generally has around 0.5 to 30 grams of salt per litre. The XH2O manufactures Brackish Water Reverse Osmosis systems with high efficiency and high recovery. Because of crisis of availability of fresh water at many places especially those are located near sea, peoples and industries have to be dependent on sea water to fulfil their water demand. SWRO systems are designed and manufacture to purify sea water and remove such a high salt contents from the water. XH2O have expertise in manufacturing such SWRO. Evaporation is a process used to concentrate a solution by removing the solvent (mainly water) in a purified form by the application of heat. Evaporator is an apparatus which utilize heat from steam efficiently to evaporate water. Multi-effect Evaporator is one of the popular methods used to concentrate the aqueous solutions. The multi-effect evaporator configuration combines two or more evaporator bodies to conserve steam. Water is boiled in a sequence of vessels, each held at a lower pressure than the last. Because the boiling temperature of water decreases as pressure decreases, the vapour boiled off in one vessel can be used to heat the next, and only the first vessel (at the highest pressure) requires an external source of heat. Based on the direction of feed it can be divided into 3 categories: Forward feed, backward feed and mixed feed. In wastewater treatment it is generally used to concentrate the impurities like dissolved salt, high boiling points solvents etc. XH2O have expertise in manufacturing MEE systems with lower space, less energy consumption and high recovery. Mechanical vapor recompression (MVR) is an energy recovery process where energy is added to low-pressure vapor (usually water vapor) by compressing it. The result is a smaller volume of vapor at a higher temperature and pressure, which can be used to do useful work. Typically, the compressed vapor can be used to heat the mother liquor to produce the low pressure vapor. Increasing energy costs have justified the increased use of mechanical recompression evaporators. Various combinations are possible, including single-effect recompression, multiple-effect recompression, multiple-stage recompression, and single-effect recompression combined with a multiple-effect evaporator. Mechanical recompression works best in a system with low boiling point elevation and where larger heat transfer surfaces can be used to lower the differential temperatures in the heat exchanger. Solar evaporation is a natural way to evaporate water and concentrate aqueous solutions. Solar ponds are artificial ponds designed to handle liquids and concentrate them using sunlight. Solar ponds are economic solution for the evaporation dependent only on renewable energy. In a country like India where summers have temperature as high as 48 °C and even winters get sufficient intensity of sunlight solar pond is a best energy-efficient solution for evaporation. The XH2O have expertise in designing solar evaporation ponds with optimal evaporation surface area. Mechanically Agitated Thin Film Dryer is an indirectly heated continuous dryer. The feed can be in the form of a solution, slurry, wet cake or paste. If required it operates under vacuum. Agitated film dryers are used to obtain the completely dried solids and separate liquid from wet feed. In wastewater treatment it is used in the zero liquids discharge plants where highly concentrated wastewater stream is feed to the ATFD and dried solids are separated from the water stream. The fixed blades in ATFD spread the wet feed in a thin layer over the heated wall. The thickness of the layer is defined by the clearance between the blade and the heated wall. A highly agitated bow wave is formed in front of the rotating blade. The turbulence increases as the product passes through the clearance. The volatile component evaporates continuously. After Completing this form you will able to see this page.